Ishi is Hebrew for Husband. "In that day, declares the Lord, you will call Me "My Husband" you will no longer call Me My Master. I will betroth you to Me forever, I will betroth you in righteousness and justice, in love and compassion. I will betroth you to Me in faithfulness, and you will acknowledge the Lord." Revelation: The small writing, Hosea 2:16,19,20, is the logos (written) Word of God. The large writing is the Rhema Word of God that He spoke to me as I meditated on these words in Hosea. 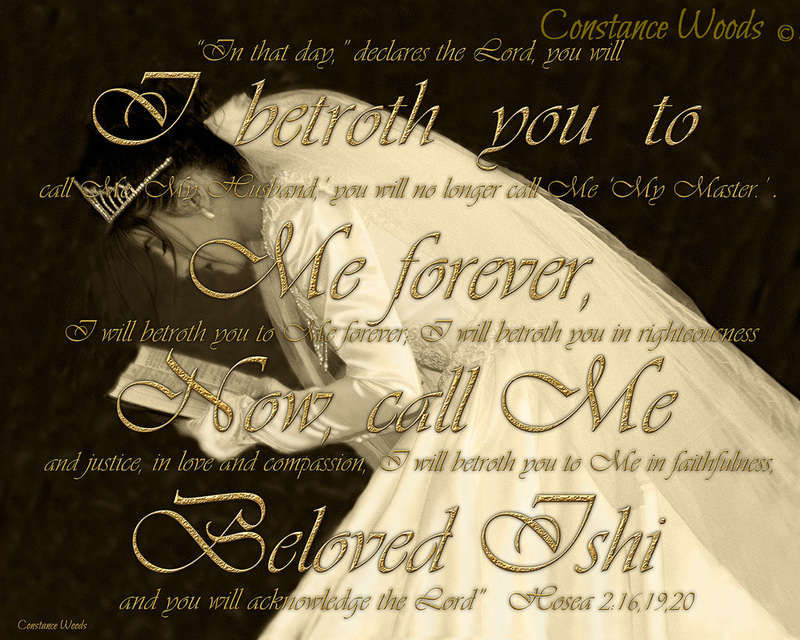 Jehovah is inviting us - His bride - "to call Him Beloved Ishi - Husband." Inspiration: This is the second of three artworks featuring a beautiful Jewish bride praying at the Western Wall in Jerusalem on her wedding day.